1b. (optional). Click the Snapshot tool found on the tool bar in Adobe Acrobat Reader 7.0 or higher. 1c. (optional) Select the portion of the image you would like to print. Move the bounding box until no white space is shown. 2. Go to the File menu - choose Print. 3. 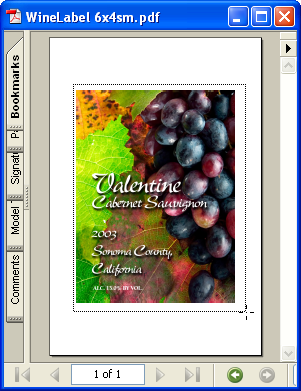 The following preview screen is displayed. Make sure the highlighted options are set as shown. 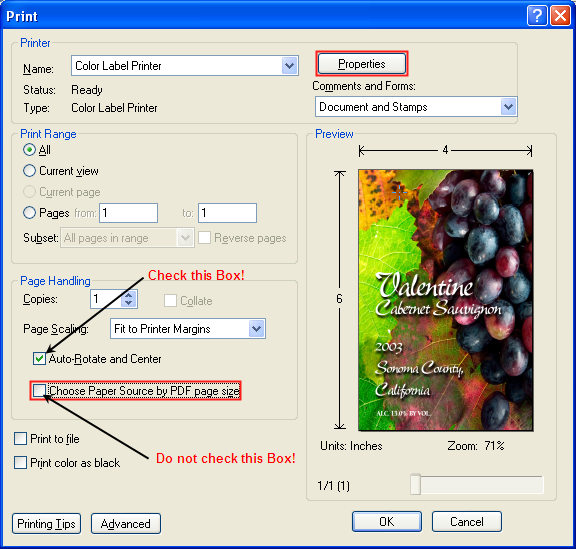 Uncheck Choose Paper Source by PDF page size. 4. Click Properties to set the Custom Page Size and other options if desired. Note: You must set the custom page size each time you print. 5. Click the Custom Page Size button. Set the Width and Height to match your label stock. (Shown in .01 inch increments.) Click OK until you are returned to the preview screen. 6. Set the number of copies and Click OK to print.